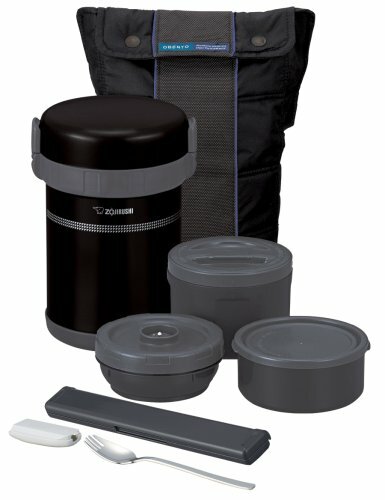 Zojirushi's Classic Bento Stainless Lunch Jar in Ultra Black provides an excellent way to safely and conveniently pack lunch where a microwave or a refrigerator may not be available. You will also appreciate the "greenness" of packing a lunch in our jars, instead of using a paper bag or disposable container. Great update to Zojirushi's bento line! I have several lunch jars from Zojirushi -- Mr. Bento, Mini Bento, and now this updated version of the Classic Bento. All the containers are great in terms of reducing costs spent on eating out, minimizing the garbage of packing lunches in disposable containers, and even helping with portion control for weight loss. So while they're all great, I gotta say that of the three Zojirushi lunch jars I have -- the Classic Bento is my favorite! While I love the four containers that come with Mr. Bento, there's always a lot of concern about staining them. They're a light grey color and are easily discolored by things like tomato soup or pasta sauce. The Classic Bento's containers are a very dark grey (darker than they look in the Amazon product picture), meaning that stains just don't show. Brilliant! In addition, both the main entree container and the side dish container are larger than the Mr. Bento's equivalent containers. So even though you have one less container, it's pretty close to the same amount of food space. On a whim more than anything else, I purchased one of these other Zoji bento boxes for my 10 yr-old early this school year. She loves the fact she can have a warm/hot meal at lunch, and I think she loves the novelty of being the only kid doing the bento-thing as well. I like that she eats healthier now. Like other reviewers mention, prepping the containers you want to keep hot (I even prep the lower-third of the bento metal container itself) with some steaming water for 4-5 minutes before you pack the food in those containers will help you keep things warmer...longer. So, my kid liked it so much, I bought this one. I have used mine now for a few weeks, and I am a bento fan like her.